Why has my job expired? To ensure that the platform runs efficiently, and that Sidekicks can be notified that they’re working as soon as possible, our platform follows specific processes to ensure jobs fill and are confirmed quickly. Once your job goes live on the platform, Sidekicks will be notified about your job and will be able to apply. 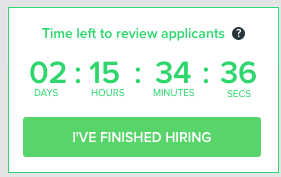 We’ll notify you when you’ve received the required number of Sidekicks and you're ready to finish the hiring process. Sidekicks can continue to apply for the request, but you will now have 72 hours to activate the request. A countdown timer will show on the request to keep you on track and we’ll send you reminders to activate the request in case you forget. We recommend ensuring you can receive emails from us to ensure you don’t miss these. If your job is starting soon (under 24 hours), we’ll email you each time a Sidekick applies for your request. If the request is not activated within the 72 hours, the request will expire and the Sidekicks will be notified that the job did not go ahead. If a job expires and you wish to re-activate it, you can find it in your ‘Completed Jobs’ list, and click the ‘Get More Sidekicks’ or ‘Post Similar’ buttons to re-post the request and re-open the job to our Sidekicks. Please note, even if you haven't clicked 'I've Finished Hiring', any Sidekicks you've hired will still be assigned to your job and will show up at the shift start day and time. If a job posted on our system does not receive any applicants within 72 hours, or the start time for the job comes around and no sidekicks have been hired, your job will be removed. If you feel like you should be getting applicants but you aren’t, please contact your local Customer Success Manager to discuss how we can help you increase applications for your request.